For more than 40 years, Scheffer Andrew Ltd. Planners and Engineers have been providing land development and planning services to communities and municipalities in Alberta, Canada. While often referred to as the “Texas of Canada”, Alberta is known for its ancient glaciers that top the Rocky Mountains, to its dry prairies and country roots. On the contrary, its seasonal and unpredictable weather patterns are known to put even the best-planned construction projects at risk of delay. In fact, throughout December to March (the harshest periods of Alberta’s winter months), construction projects are prone to an absolute stand-still. During one of those quiet winter spells, Scheffer Andrew’s Ray Penner decided to put his 15 years of model aircraft and helicopter experience to use by starting his own drone program where he began to use drones as surveying tools. 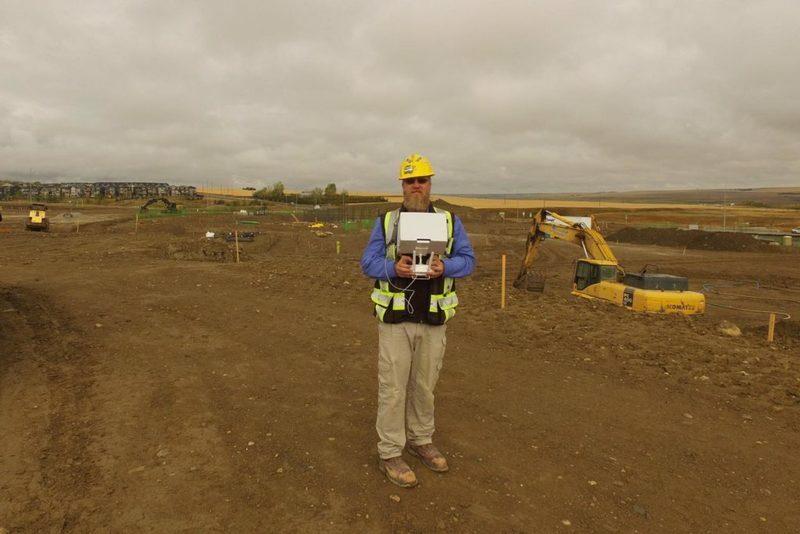 Impressed with how drone technology—in particular GPS and gimbal units—had progressed in recent years, Ray saw the benefits of drone surveying almost immediately. One of the many obvious benefits of using drones on site is the amount of ground you can cover within a short period of time. “We did 130 hectares of mapping yesterday, and we did it in an afternoon, kinda before coffee. Having a survey background, I’ve been on a lot of topo jobs where a survey like that would literally take days”, said Ray. In addition to how drones can fast track site mapping, Ray has also witnessed a significant improvement in the reduced duration of site shutdowns, which can result in hundreds (if not thousands) of dollars in lost productivity. 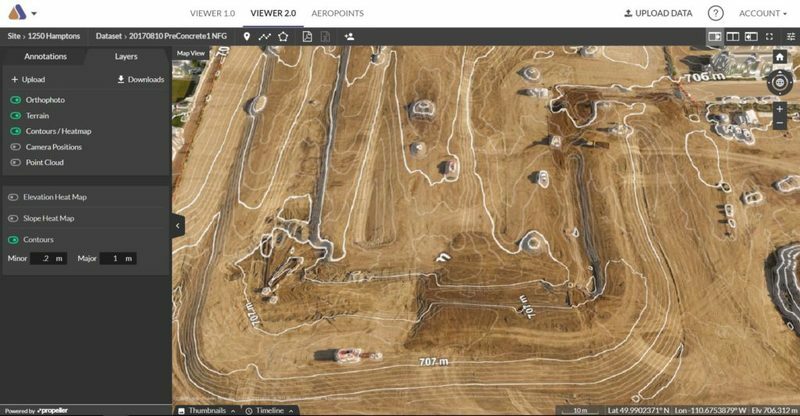 “There is the added benefit that once the earthmoving work has been completed, running the topo survey would require the site to shut down for a day. Now it only takes 15 minutes”, Ray explains. Attention to detail and absolute accuracy is the name of the game, especially where discrepencies in measurements can lead to project delays and additional costs. According to Ray, Propeller is a vital and unique component of his drone program. “Being able to produce centimeter-accurate mapping that’s rivaling GPS topo survey is pretty darn unique and awesome”, he says. To further emphasize this point, Roy takes us down memory lane. 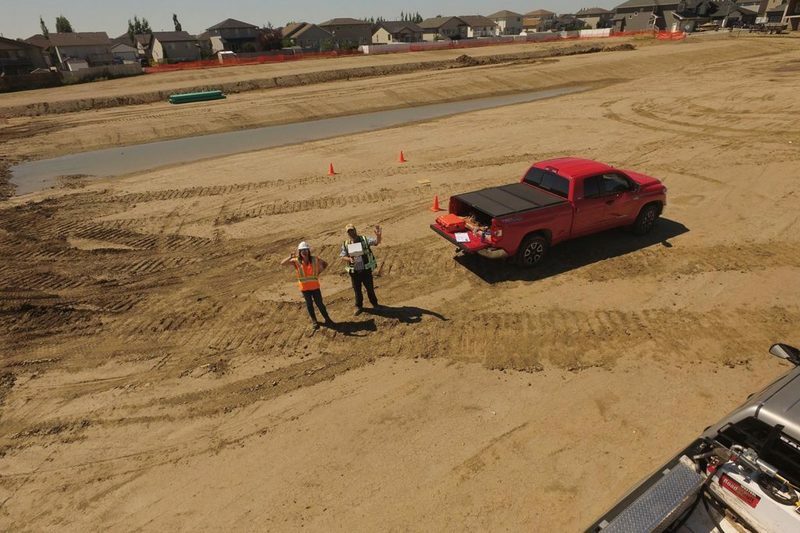 “There’s one job site that we did in Calgary—it was only 250 m x 250 m but the elevation difference from north to south was almost 5 m. The guy that was surveying it even told my engineer to get the drone as he would not be able to complete the work as quickly or thoroughly”. Using the Propeller Aero platform has helped professionals like Ray learn how to get accurate models from their DJI drones. 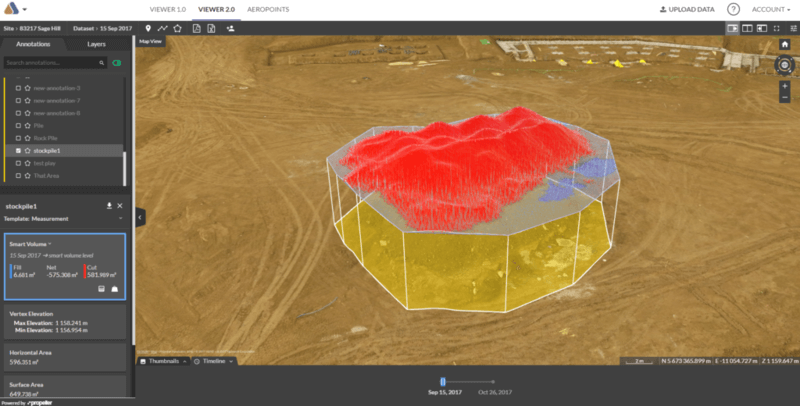 In fact, besides topographical surveys, Ray has identified other instances where drone data benefits Scheffer Andrews’ projects, such as collection of as-built data, site progression, erosion, maintenance and environmental compliance reporting. “It’s one thing to walk around the jobsite with your camera and taking pictures at the 5 ft view,” explains Ray, “But to have pictures from several hundred feet in the air, that’s a whole different level of documentation and credibility. One of the ponds that we are working on required a biologist’s oversight—and it was quite beneficial for us to be able to provide them with several months of imagery”. While topographical surveys stand out to Ray, Propeller Aero is also helping Scheffer Andrew improve their communication, both with co-workers and contractors. Ray describes an earlier case which takes place at a local Tourist Information Centre. Not to be overlooked are the safety benefits of using drones. When Ray started the sub-division job, he only had a 21 000 m stockpile. He breifly explains some of the safety advantages of deploying drones on site. 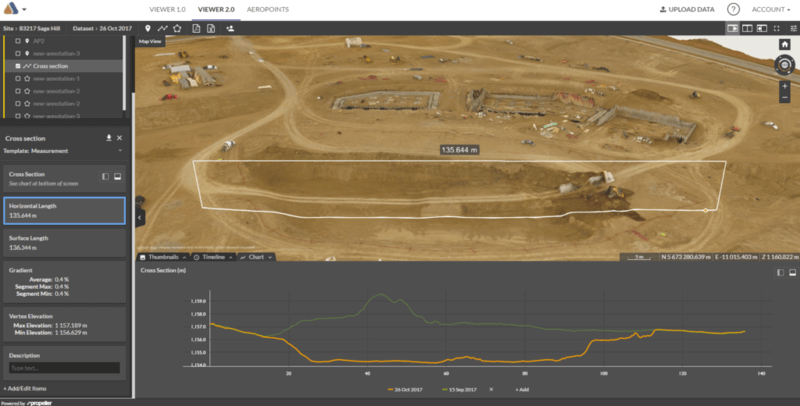 “When you have 100 individual tandem axle dump truck loads sitting in a stockpile that’s 6 m high, it’s a little hard to get an accurate survey. Plus, those guys have to climb up and down it all the time. Especially with some of the other gravel pits we’ve surveyed for them now, it’s taken days off their time, and had huge health and safety benefits of course”. When comparing software platforms for visualizing their drone data, Scheffer Andrew came to value the consistency in volume measurements delivered by Propeller. The quality of the visualizations also stood out to Ray. “Consistency is a good thing, but Propeller also elevates the shape of the stockpile so you can see it in three dimensions. And then you know you have a result that you can trust, because you can see it”. Ray continues to innovate and expand his drone program beyond topographical surveying. And what’s more, is that Scheffer Andrew have started a new program for their sub-division projects where they survey roads at a lower altitude. After providing feedback to Propeller Aero’s developer team that contour lines should be customizable to the smallest possible intervals, Ray can now identify and rectify any deficiencies in roadways prior to the final acceptance certificate when the subdivision is handed over to the city or public entity. Ray is also piloting the use of drone data for project planning. The idea is to acquire data before the project starts, so they can use the winter months to analyze it and optimize plans. “What I tell people is ‘you spend a little extra time looking at the model—but when you go to the field, you’re going to be 100% smarter because you already have that overhead image ingrained. It’s a lot easier to make connections”.